Sometimes I see little kids at the mall with their parents and it brings me right back to when my mom used to take me along with her to run errands. I used to be bored out of my mind. I didn’t at all understand why or how my mom could spend what seemed to me hours, picking out fruits and vegetables – or worse yet – household stuff. There was a silver lining though – errands always ended with a trip to the library (yes, I was a nerdy kid) and a stop for cheddar cheese muffins. There’s a Canadian muffin chain that is in almost every mall I’ve ever been to as a small child. They bake their muffins fresh throughout the day and the smell wafting from their little kiosks is absolutely intoxicating. I remember their chocolate chip muffins being especially good, but once I had a taste of their cheddar cheese muffin, I was a goner. They’re sweet, savory, and extra cheesy. I’ve been trying to recreate them at home but it must be a trade secret because mine never turn out quite the same. However, once I tried making cheese muffins without attempting to create that childhood memory, I was pleasantly surprised. All cheese muffins are delicious. Especially when you’re using Canadian cheddar with some sliced green onions for a bit of depth. Preheat to 425° and move a rack to top third of the oven. 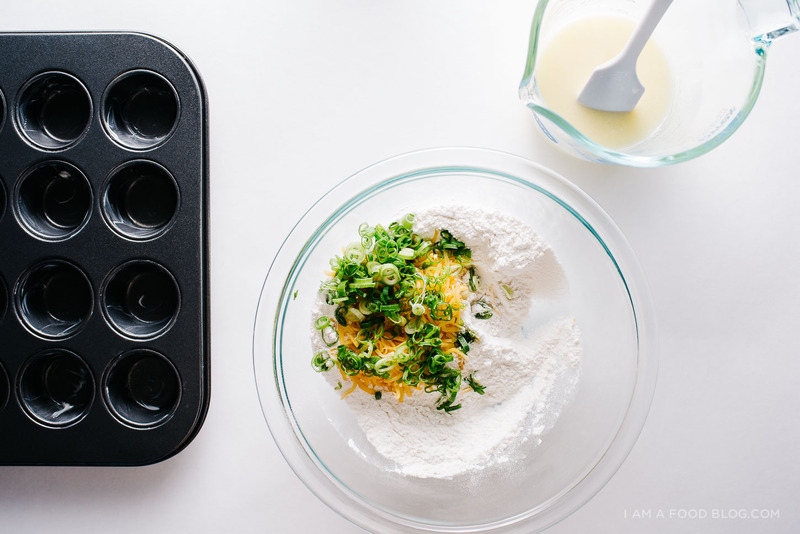 Lightly butter or grease a mini muffin tin. 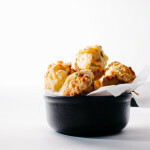 In a bowl, mix together the flour, baking powder, baking soda, salt, cheddar, and green onions. Set aside. In another bowl, whisk together the melted butter and oil. Add the sugar and mix until well combined. Whisk in the egg. When smooth, add in the buttermilk and sour cream. Add to the dry ingredients and fold until just combined, being careful not to over mix. Scoop into your prepared pan and top generously with extra cheddar. 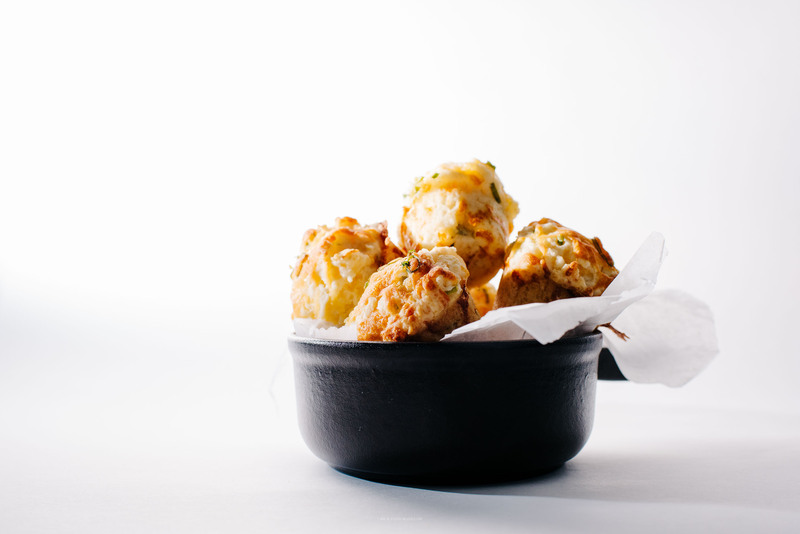 Bake for 5 minutes and then turn the oven down to 350° and bake for 8-10 minutes or until cheese is golden brown and bubbly and a tester comes out fairly clean. Let cool in the tin for 10 minutes before removing. Enjoy warm! i always need more cheddar in my life! and i always hated those errands- sunscreen shopping (wherein my mom would look for the ones that wouldn’t rub in all the way because they’re supposedly healthier despite the struggle of trying wearing it without looking ghostly) was the worst. Haha, I remember thinking the same thing about my mom’s shopping trips sometimes. How did she not die of boredom? This recipe looks amazing. All that cheesy goodness is making me so hungry right now! Beautiful little breakfast bites. I just want to pop them in my mouth for a celebration. Oh my these look amazing! I can’t wait to try them!!!!! I just want to pick up that bowl and tip all of those into my mouth at once. These look so, SO good, Steph!! it’s called mmmmmmuffins. they usually have them in a mall! Such nice snacks! I would love them. 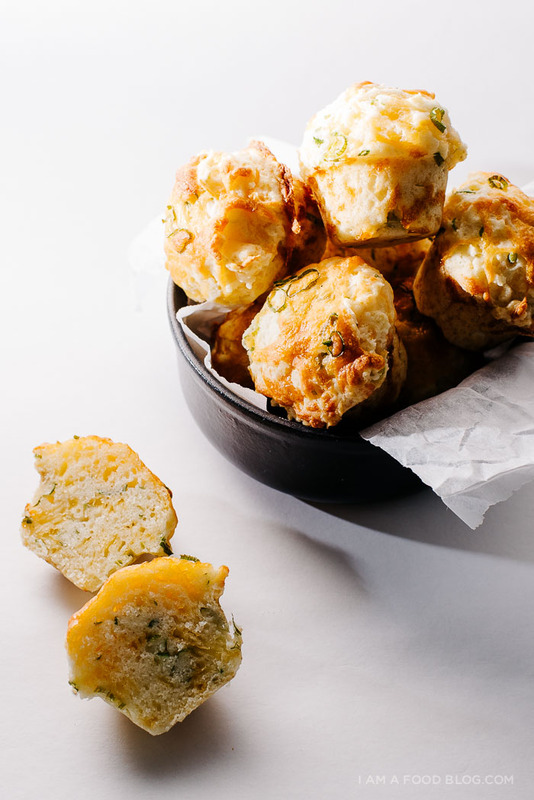 Equally good as scallions with cheddar are fresh chives – and if you grow them, break apart the chive flowers and add those too. These sound fantastic! Now I know what to take as a little treat for my shopping trips. 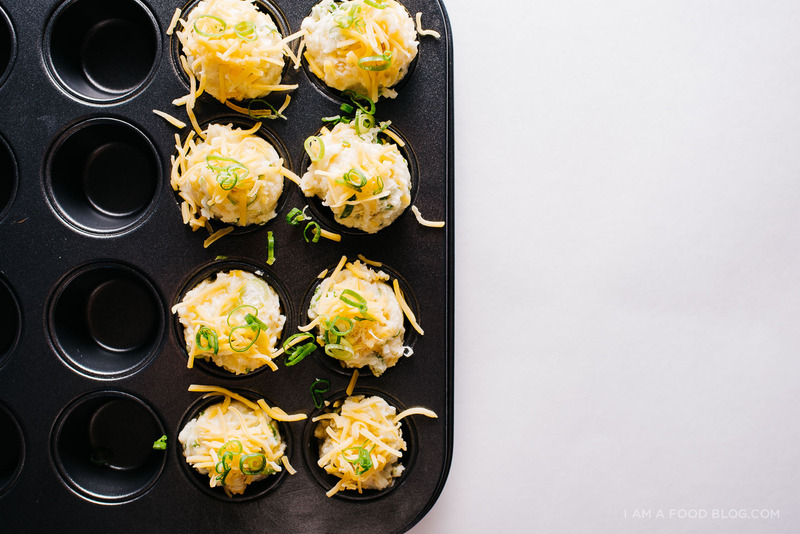 I always end up craving something while running errands with my family, and these cheese muffins sound very easy to carry around and eat at any time. Help! Where do I find Canadian cheddar (I’m a bit far to just hop over the border) or may I sub something else? hello! 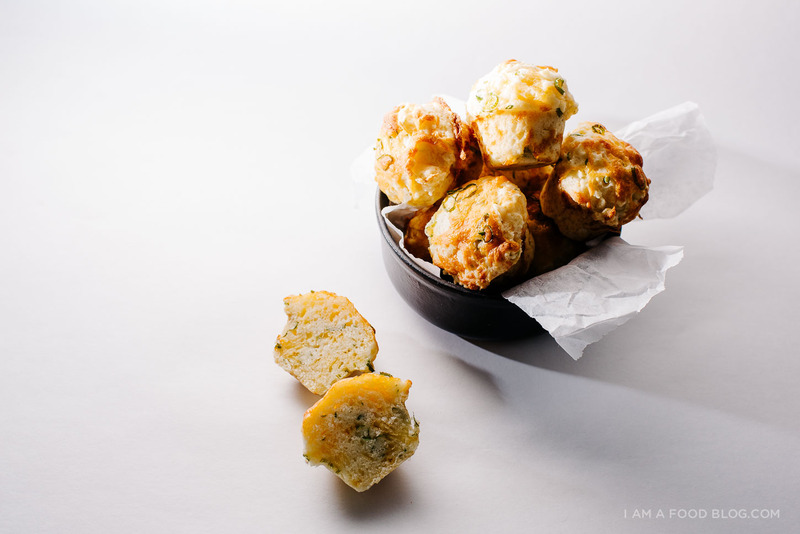 these look delicious and perfect for the holidays as a substitute of the normal cheddar biscuits we make – I’m a sucker for anything in a mini muffin pan. I’m more of a salty/savory person – is it possible for me to omit or cut down the sugar from the recipe? also – what does the sour cream add? I’m just wondering if I could possibly omit it too to simplify the # of ingredients I need to buy..
the sour cream adds a bit of tenderness and moisture. i think if you took it out you’d end up with a dense muffin. the sugar on the other hand can definitely be cut down or omitted entirely. hope that helps!